Boston Bruins defenseman is an NHL draft rarity: he’s only the third player selected with the final pick in a class since 2000 to ever see a single shift in the NHL. The other two- Jonathan Ericsson (Red Wings- 2002) and Patric Hornqvist (Predators- 2005) have gone on to have solid big league careers, each with 400+ NHL games and counting. 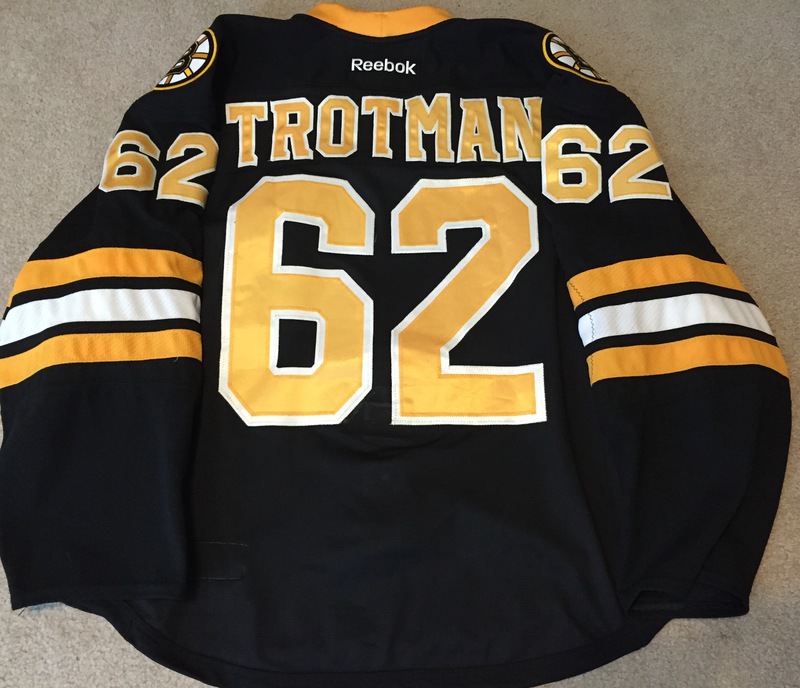 Trotman’s 29 NHL games (1 goal, 5 points) is a far cry from them at present, but since the B’s traded with Chicago to acquire the pick they used to tab the Indiana native out of Lake Superior State University 210th overall, he’s gone on to reward the team’s patient approach with him. At 6-foot-4 and a shade under 220 pounds headed into training camp, Trotman is one of the bigger and stronger players on the team. He’s a fluid skater for a guy his size and he sometimes does not get enough credit for his vision and ability to move the puck. His rocket shot forces penalty killing units to respect him by trying to disrupt and take away his time and space. Though he’s not likely to ever develop into a dangerous two-way threat, his size, reach and smarts makes Trotman a good bet to be a solid supporting cast player as a bottom-pairing NHL defender with the chance to evolve his game into the middle pair with special teams contributions down the road. Trotman spoke to the Scouting Post while on the road today to Indiana for a quick stop before he drives to Boston this week. With the B’s, the team that gave him a chance five years ago as a twice previously passed up player in the NHL draft, he is in the second of a 2-year pact and the first in which he receives 1-way pay. Bigger things are expected of Trotman this season and he has the inside track (in my view) of taking one of the available defense positions when the regular season begins. It has been a pleasure to bring you this series, which started with center Ryan Spooner, continued with Boston blueliner Torey Krug in 2 parts, detoured a little with Flames goalie prospect and NCAA champion Jon Gillies before concluding with Trotman. I think that sometimes, fans have trouble managing expectations due to draft pedigree. Some of the bigger critics of Trotman’s chances of sticking in the NHL would likely have less of an issue with him had he been 18 when drafted and picked earlier, but because he was just one selection away from being an undrafted free agent, some hold that against him. Well, that’s a fair point, but given how far he’s progressed from the raw, gangly 20-year-old at his first Boston development camp, I’d submit that the B’s have done pretty well with him. There will be bumps in the road along the way, but he’s got the tools and character to become a solid, if unspectacular presence at a bargain rate for this club, and has performed far better than a good number of defensemen taken well before him in the class of 2010. Enjoy the interview- more in store with the blog this week, including a two-part rookie camps preview by Conference with players to watch and some guys I just happen to like and why I like ’em. Kirk Luedeke: Zach, the last pick in the NHL Entry Draft may not come with as much fanfare as the “Mr. Irrelevant” selection in the NFL draft does, but take us back to 2010 and tell us what you remember about being the final pick, how you found out about it, and what it has meant to you to work your way into the 29 NHL games you have played since the 2013-14 season. Zach Trotman: It started during my freshman season (at Lake Superior State University)- I started get to get a little more notoriety and some interest from NHL teams. I interviewed with New York and my agent had kind of told me there were some (NHL development) camps that I was going to be able to get into next summer and all that, so I kind of viewed it as a long shot to be drafted into the NHL and didn’t really think that I was going to have that opportunity. I knew I was a late bloomer and I was coming around later, so I was hoping for a chance but never really expected to be drafted, so just the interest teams had and the possibility of being drafted was cool for me and then as it got closer to the draft, it seemed like it might happen, so I watched it…not real closely or anything…I watched the first round and a little bit of the second and third round the next day, so I was driving home from Lake State- was working camps up there. I was on the way home and it was kind of later (Kirk note- the 2010 draft was held on the West Coast in Los Angeles) five or six o’clock maybe, and my agent gave me a call. I thought, the draft is over, and I knew he was going to talk to a couple of teams about getting me into some camps, and so I thought that’s what his call was all about. He called me and told me that Chicago had traded the last overall pick to Boston and that they had picked me with it. Naturally, I was ecstatic and awestruck I guess. It was a surreal feeling. I obviously called my parents right away and I was extremely excited and at the same time, I knew that it set me up for a lot of hard work that I had to do to overcome being the last overall pick- those are long odds. So, I think in a way, it kind of made me more focused and more determined to prove myself. KL: You’re only the third player in the last 15 years going back to the 2000 NHL draft to play in an NHL game after being the last selection. The other two are Jonathan Ericsson in 2002 and Patric Hornqvist in 2005, so it is a rarity. People who have reached the NHL say that getting there is difficult enough, but staying in the NHL is the real challenge. What are your own thoughts and perspectives on that given your own experiences in Boston over the last two seasons? ZT: I spent three years in Providence and my (first NHL when the Bruins were playing in Ottawa) call up was based on me being lucky enough to have my passport on me and that’s what gave me the opportunity just to get a game in. I think that was a huge opportunity and the fact that I think I had a pretty good game kind of opened eyes, like, ‘Oh, wow- he can play at this level,’ and from there it almost gave me a little more attention and allowed people to realize I had another level I could go to. So I think that you’re right- it takes a lot to get there, not only in terms of hard work and the right tools, but just the opportunities, too. And so actually being able to get there took a lot of things to line up right and once I did get there, and I wouldn’t consider that I’m there (in Boston) yet, even though I’m on the one-way next year- I have a lot of work ahead of me to stay at this level and play consistently and be successful both as a player and as a team, which is the biggest part. I’m looking forward to the challenge from just getting there to staying there and becoming a regular and not just being a bubble guy or someone where people think- ‘maybe he can play here or maybe he can’t’ play here- I want to be one of those guys who can play every night and so that’s the next step and it’s something that’s going to be very difficult. KL: Your first NHL goal came against Detroit. It was not only the winning goal, but happened in front of friends and family given your years spent living in Novi. How special was it for you not only to get that 1st NHL goal but to have it happen under those circumstances and against the Red Wings as well? ZT: It was an awesome feeling- it was one of those things where I hadn’t really gone through a long stretch of games like that before where I hadn’t scored a goal. I’m not a huge goal scorer but I manage to get some in every once in a while with my shot, so being up there for quite a few games before it happened and then you get to a point where you say, ‘I’ve had my chances, and I’m wondering if I’m ever going to get another one to go in here,’ and then I just stuck with it and kept shooting and for that one to go through in overtime, in Detroit, with all my friends and family there and such a critical part of the season- it couldn’t have happened in a better way and looking back on it now, it makes the wait worth it- just to have the first goal be such a special one like that. It was incredible. KL: Were you a Wings fan growing up? Who were some of the NHL players you always admired and rooted for? Who are some of the defensemen you’ve always tried to model your game after? ZT: I was. I always watched Nick Lidstrom growing up and I’m sure there are a ton of defensemen who say that. But, being right there in Detroit and it gave me a chance to watch him a lot and obviously, everyone wants to model their game after a guy like that. The style of play…he was such a smart player who knew where everyone was, what was happening on the ice- it almost seemed effortless in the way he would shut down plays and move the puck and get his shot through. Those are all things I’ve always wanted to be able to do and bring to my game. Obviously, I’m less of the finesse side and a little bit more of the larger player side so I have to bring the physicality aspect along with that and those main things of moving the puck quickly and efficiently, being a smart IQ player and knowing what’s going on at all times and trying to use that to your advantage are definitely things I picked up on watching him over the years. KL: Looking back on the several Bruins development camps you attended before becoming a pro, what aspects of your game do you think have seen the biggest improvement since 2010, and how important were those camps to your preparation in terms of getting to Providence and knowing some guys and understanding the systems and what was expected of you when you got there as opposed to seeing and hearing it all for the first time? ZT: In college, we played a lot more of a man-on-man system, so for me, closing on guys was a lot different in pro than it was in college because I could contain more in college. Once I got to pro, and it’s more of a zone, you need to close on guys and end the play so that the rest of your teammates can read off of you and then the system starts to take effect. So, I think the biggest challenge for me was continuing how to learn to close on guys and using my size more efficiently to be physically punishing in corners and reading when I could jump a guy and really close him off like that. It wasn’t easy- it was difficult, and I struggled with it my first year and then progressively got better with it from there. I think that’s one thing that has improved a lot and can continue to improve. I would say that my physicality has gone up but some more big hits, learning how to catch guys a little more so I can make those closings and those hits in the corner more punishing on people so that the next time they go into the corner, they’re thinking about what happened the last time. KL: So when you talk about closing on players and the man-to-man system you played in college versus the zone schemes Providence and Boston employ, for the layman- and I mean sometimes, players or analysts throw out terms that fans might not be familiar with, so this is a chance for Hockey 201 with Zach Trotman– you’re talking about gap control. So, for folks who might not know what that is- can you talk about gap control and why that is such an important skill for an NHL defenseman to have? ZT: Whether it’s in the neutral zone or the offensive zone, it’s keeping the distance between me and the player with the puck or the puck itself close- a small distance so that when something happens or I have the opportunity to make a hit on a player to separate them from the puck, it’s not very far that I have to go to do that. I don’t give them extra room to make a play, I don’t give them room to get a shot off or have time to do something and feel comfortable with the puck. It comes back to watching Lidstrom when I grew up because I could recognize when can I play a little tighter on this guy or do I need to back off a little bit. So, that really gives me an extra step and jump a guy in the corner before he can make a play and be able to play tighter on guys and realizing when you can do that and taking a good angle on the play so they can’t beat you out of the corner or beat you down the wall on the rush. 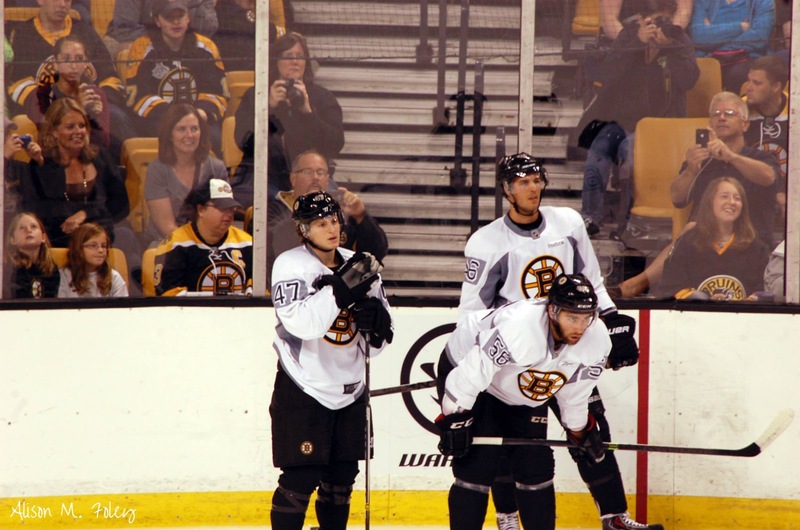 KL: Bruins have had a summer of change here- what are your thoughts on how you felt when getting the news that both Milan Lucic and Dougie Hamilton were traded on the same day? The larger thing is that neither player brought back a plethora of talent that are expected to play and contribute right away. What are your thoughts on the opportunity that Dougie’s departure presents for someone like you and the other defensemen in the Boston system? ZT: Obviously, it’s an NHL defenseman that’s out of the system but it’s not one that is going to be easily replaced. He was a huge presence- he ate up a lot of minutes and put up a lot of points. He was a very talented player and so in some way, shape or form, that’s a job we’re going to have to take care of as a (defense) corps and especially the right-handed ‘D’ this year- finding a way to create offense to make up for that loss, and then trying to eat up those minutes. He’s a good player and he ‘ll be tough to replace, but I think we can do it. Seeing Looch go obviously is tough because he’s a great guy as well, and he’s a very hard-nosed, physical player that can put up points. He’s a Bruins-type player, but every once in a while I guess things just have to change and the team needs some fresh faces. We’ve got some guys like (Matt) Beleskey and (Jimmy) Hayes that are big and play that hard, strong game. I think the team has filled in what we lost or traded and I think we’re going to be a really good team this year. KL: Do you think that you and Torey Krug– I know you’re an Indiana native but you can also claim Michigan because you spent a lot of years and finished high school there- a couple of Michigan guys would be a good pairing there in Boston and are you looking forward to maybe seeing more of a chance to settle in and play some extended minutes with him if it works out? ZT: I think I played with him a couple of times last year at points and he’s an extremely talented offensive player and he’s extremely smart in the d-zone as well, so playing with a guy who can move the puck like that, who can make plays offensively would be a complementary pairing where I can be more of a shutdown guy and keep it simple in the offensive zone by getting my shots through and covering for him so that he can feel like he can jump in the play. 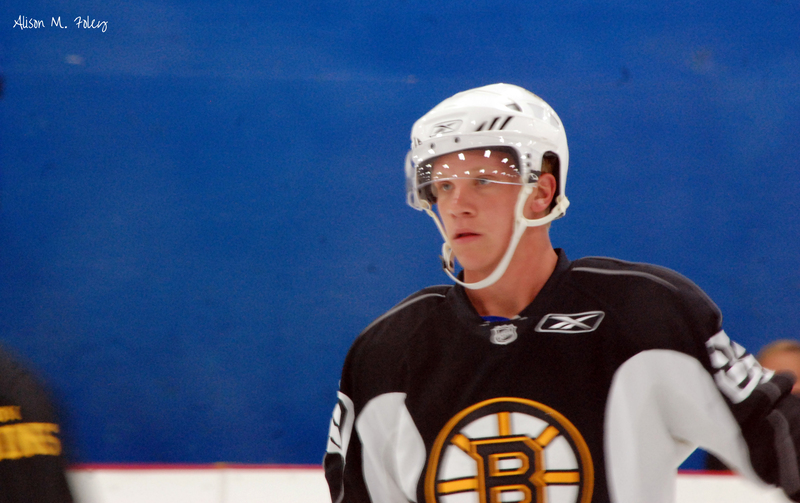 I think it would be a blast to play with Torey- he’s a really talented player. He plays with a lot of heart and that’s something that’s contagious. KL: Congratulations on your engagement- is it safe to say that the people of Boston might eventually see an even bigger talent with your fiance, Jeanna, who got her Master’s from Boston University’s journalism school and is already the sports director for her television station in Rochester, Minnesota? ZT: Yeah- she’s definitely got all the talent over there (laughter). Talent and hard work- that’s how she’s earned her success- I just try to keep up.